In the location of Qesm Borg Al Arab, the Monastery of Saint Mina is a famous religious institution which not only devotees but tourists also like to visit. 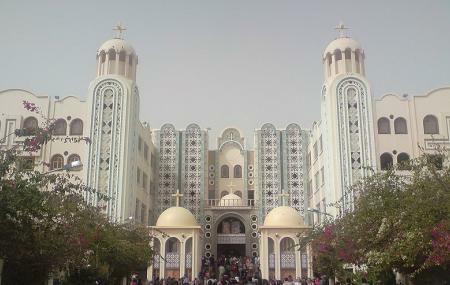 Primarily it is a Coptic Orthodox Church which has been built in the year 1959. It has been dedicated to Saint Menas. You can find the original church's ruins in the place but the new building of the church is nothing but stunning. It was the initiative of Pope Cyril VI whose initiative built the foundation of the new church. The place is one of the threatened World Heritage Sites and innumerable devotees come to the Monastery of Saint Mina each year to feel blessed and healed. The most wonderful day to spend with your family. Relaxing, pleasing and holy place. Don't forget to buy your supply from olive, it's fresh and pure. Enjoy the archaeological sites. Do not forget to visit the Marble City. Absolutely gorgeous church, next I will visit with my little one and husband.